TRELLIS ASSEMBLY INSTRUCTIONS AT BOTTOM OF THIS ARTICLE. Every inch of space in an aquaponics tray is high-value ‘real estate’ for growing food. Unlike ‘dirt gardens,’ there’s no room for plants to spread their luscious leaves, vines and blossoms across a large area as they mature to produce food. The rule of thumb (make that a GREEN thumb) is for food to grow as quickly as possible. 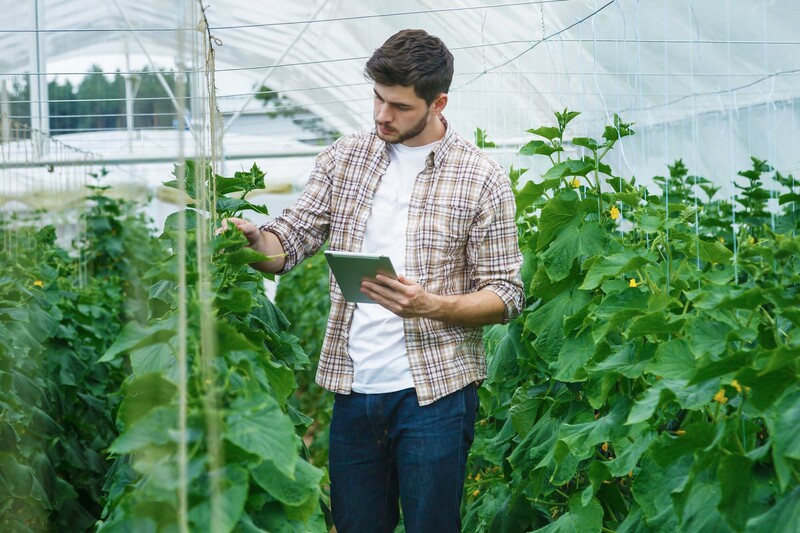 In other words: Plant it, grow it, harvest it and then repeat the process immediately by planting a new plant that was grown from seed (over a few days) on the SAME DAY the previous plant was harvested, so there is always a continuous cycle of production, and there are always plants in various stages of growth within the farm. The two years PFAS LLC spent in our Research Center in the Tropics highlighted the problems created from the constant heat and high humidity which forced us to find solutions to this ongoing problems for creating ample air flow, suspension of the plants for vertical growing and allowing for adequate sunshine within the greenhouse. By continual experimentation with locally available materials, we invented a simple trellis system using chicken wire (made of wire or plastic) with 2″ openings and clothes-line rope which solved all our problems. It was very inexpensive and easy to install. THE PLANTS LOVED IT. Their blossoms stayed dry. 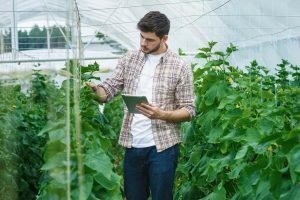 The new system took the pressure of the stems and vines and allowed for sunshine to reach all parts of the plant and happily, our production soared. 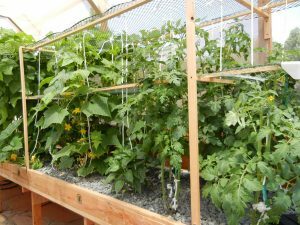 When the plants were small, they did require a minimal amount of tying (to the clothes line rope) and then they did the rest on their own! 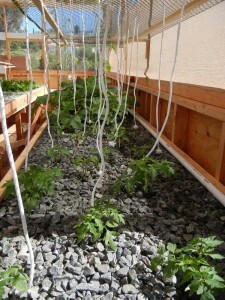 Some of the larger stems require us to delicately thread them through the chicken wire so they would grow naturally. 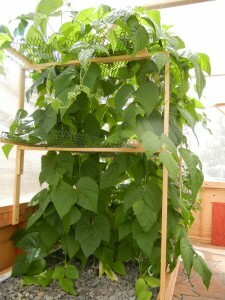 After 45 days of plant growth (green beans) with a Portable Farms Trellis. 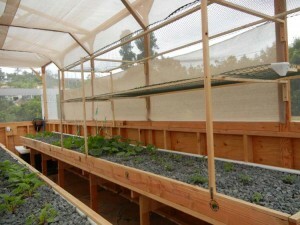 Two frames containing plastic chicken wire suspeded above grow trays to support growing blooming plants. 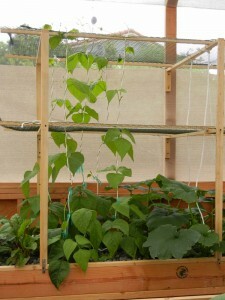 Tie soft clothes line rope on top wire from top tray to support growing plants for vertical growing. 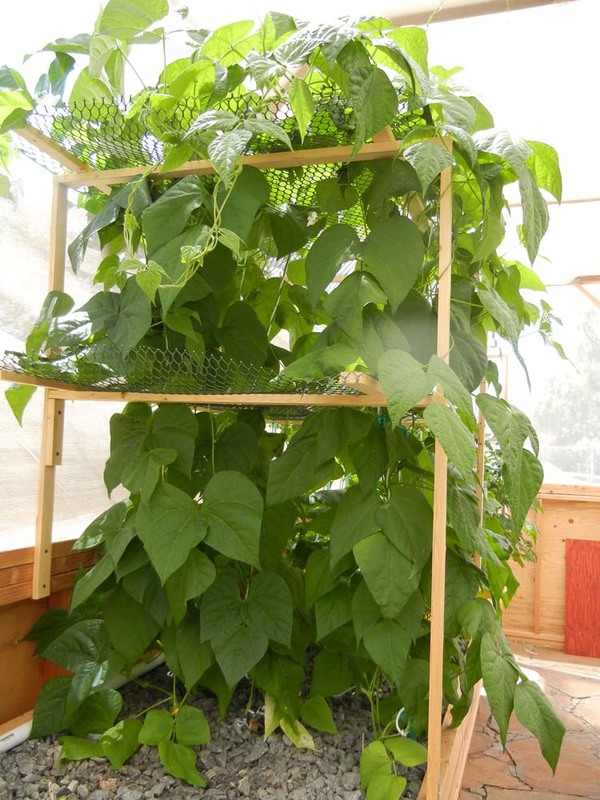 The Portable Farms tropical trellis system is yours to copy, modify and use in your own backyard ‘dirt farm,’ your backyard aquaponics system or your commercial aquaponics installation. It’s our gift to you. Now go grow food and send us pictures.